The Rashtriya Swamsevak Sangh (RSS) has categorically told BJP President L.K. Advani that he must resign from the party’s top post by October when an all-important meeting of the RSS is to take place. Has the official response to flooding in Mumbai been inadequate? Q: What steps should be taken to curb the growth of population? 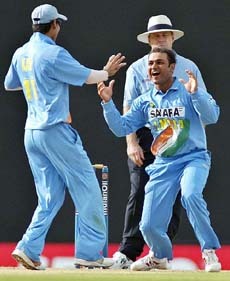 Virender Sehwag (right) and Mohammed Kaif celebrate the dismissal of West Indies batsman Narsing Deonarine during the one-day international tri-series match between India and the West Indies at Dambulla, Sri Lanka, on Sunday. The world of jihad is undergoing a never-before churning process which is set to throw up significant new trends in international terrorism in the months to come. 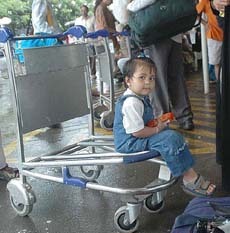 Life in Mumbai was thrown out of gear yet again after heavy rain from Saturday night flooded roads and hit transport services. It was under the Vajpayee government that India found a place on the world map as a nuclear power, following the Pokhran tests. An Air-India plane carrying 315 passengers from Mumbai to London made an emergency landing at the Delhi airport tonight after the pilot noticed a technical fault. Discovery astronauts on the first shuttle trip to the International Space Station since 2002 — and perhaps the last one for some time — worked today to unload tons of supplies and equipment brought from Earth for the station’s two-man crew. If the national and state highways and link roads are the lifeline of a state, then Punjab is in a critical condition. 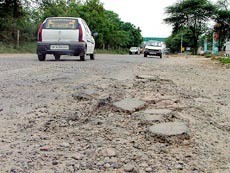 Nearly 40 per cent of its important roads, including national and state highways, are in a shambles. A view of the Bathinda-Mansa road.